A six-person Best Friends Animal Society team is en route to Missouri to evaluate the condition of 200 dogs seized from a commercial breeder. Best Friends, working in concert with the Missouri Department of Agriculture and Noah’s Wish, a California-based animal rescue group, will also help with the placement of the dogs with rescue groups. The Missouri Department of Agriculture has asked Best Friends Animal Society to evaluate approximately 200 dogs rescued from an unlicensed breeding kennel near Tecumseh, Mo. A Best Friends rapid response team of six was en route to Missouri today to examine the dogs and help with placing them with rescue groups. Best Friends' involvement follows actions by the Ozark County Sheriff's Department, acting in concert with the Missouri Department of Agriculture's Animal Care Facilities Act program, to close the facility and take possession of the dogs. A six-person Best Friends team will arrive in Missouri later today and is expected to be on site for approximately four days. 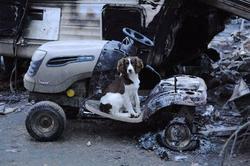 Preliminary reports indicate that a fire had damaged the kennel and that some dogs had been injured. Noah's Wish, a California-based animal welfare organization dedicated exclusively to rescuing and sheltering animals in disasters, will set up a temporary shelter on the kennel site. "We will be working to stabilize the situation this afternoon by helping to gather the dogs," said Nikki Sharp, campaigns manager for Best Friends Animal Society. "Then we will assess them and work with the State of Missouri to provide contact with groups who can take the dogs and care for them." The initial investigation began in September, 2008 when the Department of Agriculture asked River Valley Puppies Kennels to surrender 50 dogs because it had not passed a state inspection or been licensed by the state. Recently, the state discovered that the unlicensed kennel was continuing to do business and took steps to remove all the dogs from the property. Misti Preston, spokesperson for the Missouri Department of Agriculture said help provided by Best Friends and Noah's Wish would be welcomed at the rescue site. "Although the Department of Agriculture does everything we can to protect the health and safety of animals, we don't have all of the resources needed here at the Department of Agriculture to facilitate the rescue of large numbers of dogs," Preston said. "We truly appreciate the efforts and rely on outside groups such as Best Friends and Noah's Wish, who bring their experience and knowledge to the rescue effort." Noah's Wish is an experienced rescue organization, which, like Best Friends, includes experience at Hurricane Katrina and other recent natural disasters. "We are looking forward to working with Best Friends as we round up the dogs and make sure they are healthy, safe, and ready to go to a new home," said Noah's Wish Board Chair Amy Maher. "It will be a collaborative effort with Best Friends and the State of Missouri so that we can find better homes for these dogs, who have suffered unfortunate circumstances through no fault of their own." Sharp said the Missouri State Department of Agriculture's oversight and inspection of commercial breeding operations is a positive step. "But oversight by the state is only part of the solution," Sharp said. "Best Friends advocates adoption, but if people do buy from a breeder, they should not buy dogs from the internet or purchase from pets stores because the majority of these dogs come from puppy mills. Additionally, if people notice neglect at a commercial breeder's facility, they should report this to local authorities who can take appropriate action." The action against River Valley Puppies Kennels is one of 23 enforcement actions taken by the State of Missouri since the beginning of the year, resulting in the rescue of more than 1,100 dogs. Operating a breeder's business without a license in Missouri is a Class A misdemeanor punishable by a $1,000 fine. Sharp stressed that volunteers are not needed at the puppy mill site, but people interested in helping can make a donation for the care of the puppies by visiting http://www.bestfriends.org. For more information on the Missouri puppy mill rescue, visit: puppymills.bestfriends.org. Celebrating its 25th anniversary in 2009, Best Friends Animal Society is one of America's foremost animal rescue organizations. Best Friends advances nationwide animal welfare initiatives by working with shelter and rescue groups around the country. On any given day Best Friends Animal Sanctuary, the nation's largest facility for abused, abandoned and special needs companion animals located in southwestern Utah, is home to approximately 1,700 dogs, cats, horses, rabbits, birds, and other animals. The society also publishes Best Friends magazine, the nation's largest general interest, pet-related magazine with approximately 300,000 subscribers. For more information, visit http://www.bestfriends.org.